I don't like chocolate chip cookies (insane, I know! ), but I do love a good oatmeal cookie. Both these recipes call for sprinkling coarse salt over the cookies before they go in the oven—sounds like an excellent idea to me. "... 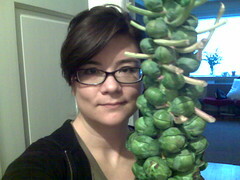 I have a secret weapon in the fight against dried out, tough meat. A secret ingredient so simple, and so easily implemented, that once you try it, you'll never make a chicken without it again: lardo, otherwise known as cured pig fat." 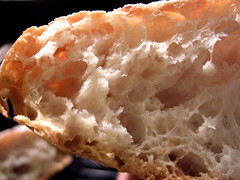 My only successful attempt at bread-making has been the no-knead recipe, but I'm going to have to try Dr. Hertzberg's recipe for simple crusty bread from his book, Artisan Bread in 5 Minutes a Day. It sounds just as easy, takes less time to come together, and appears to yield great results. For my biscuit recipe collection: Touch-of-Grace Biscuits adapted by Orangette. Seasonally appropriate weather may have finally arrived, which means I can start thinking about some of my favorite fall ingredients and recipes. I'm not doing anything fancy with these tonight (olive oil, salt, pepper, roast), but the next stalk of brussels sprouts to enter my kitchen undoubtedly will find itself on the receiving end of the David Chang treatment. It's a meatloaf extravaganza at Serious Eats today. 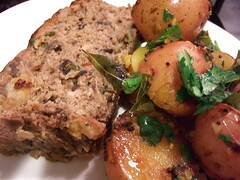 To celebrate, I made tamarind glazed meatloaf (recipe).